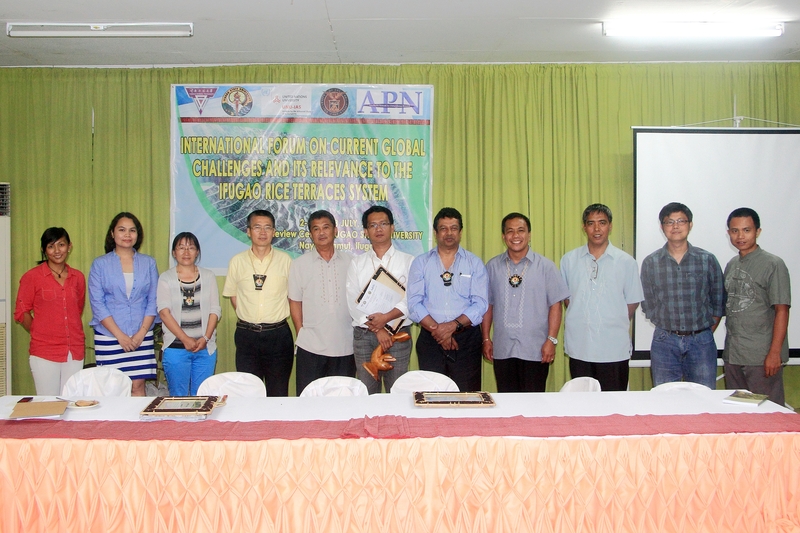 On 28 July 2015, UNU-IAS co-organized the International Forum on Global Challenges and its Relevance to the Sustainability of the Ifugao Rice Terraces, hosted by Ifugao State University (the Philippines). Among the participants were researchers from UNU-IAS, Yunnan University (China) and Ifugao State University, as well as local community representatives, farmers, and government officials. Serafin Ngohayon (President, Ifugao State University) spoke about the university’s leadership in conservation ― most notably the removal of the Ifugao rice terraces from the list of World Heritage in Danger. Marlon Martin (Save the Terraces Movement Inc.) presented various development initiatives, which incorporate community-based heritage management, institutionalisation of indigenous knowledge transfer, archaeological and ethnographic research and community-led eco-tourism. Luohui Liang (Programme Coordinator, UNU-IAS) gave an introduction to Hani rice terraces and explained how agro-diversity can serve as a strategy in dealing with water shortages, among others. Srikantha Herath (Senior Academic Office, UNU-IAS) presented on the background and outcomes of the UNU-IAS project Developing Ecosystems-Based Adaptation Strategies, which included the development of strategies based on groundwater modeling and climate forecasting. He also commented on the impact of climate change on water availability in Ifugao. The event inspired a lively discussion among local government officials, academics and NGOs about important issues ― such as the livelihoods of the farmers ― that need to be taken into consideration when developing conservation initiatives. Finally, the speakers discussed the benefits of forging greater collaboration between rice terrace communities in Hani and Ifugao world heritage sites.